Whether you want to make a few buttons for a birthday party, distribute buttons to support a cause, or start your own pin-back button business, Badge-A-Minit has the button machine you need! From beginner hand press button makers to fully automatic button machines, our button maker machines will have you making professional-quality pin-back buttons in no time. Want to make just a few buttons for fun? Check out our 2 1/4" Starter Kit. At $29.95, it's the world's lowest-price professional hand press button maker and comes with everything necessary to create your first 10 pin-back buttons. Or step up to a table-top bench press for a quicker manual button-making. Need to make a few hundred buttons (or more)? 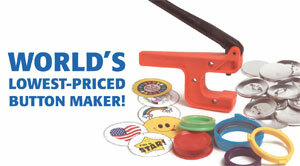 Try our 1 1/4", 2 1.4" or 3" Badge-A-Matic System. You can make up to 300 buttons per hour with these semi-automatic machines! Or invest in our electronic, fully-automated button machine and create finished buttons with just a touch of button. It's that easy! Our popular 2 1/4" button machines are perfect for making campaign buttons for your favorite candidate, reward buttons for students, awareness buttons for local charities, and identification buttons for groups or family reunions. Need a different size button? Choose a 1 1/4", 3" or combination button machine that meets your specific button-making requirements. Crafted with high-quality materials, Badge-A-Minit button machines are proudly made in the USA and come with a free LIFETIME Guarantee!